What is the correct type of wood filler & stain to use? I'm repairing the mahogany plywood deck of an 1958 Peterborough Nomad and there's one area that's been gouged (an "L" tear)that was previously filled with regular wood filler (eg: Elmer's). I've chiseled most of that out. As well, there's a number of holes (nail countersinks; old screws removed) - all of which need filling. I've been 'advised' to use an epoxy wood filler & stain it with 'matching' stain before filling the 'holes' etc., but haven't had much luck confirming this, nor finding the appropriate product. 'Others' have said to use regular wood filler (eg: Home Depot)& stain it. I'm not sure that's right either? 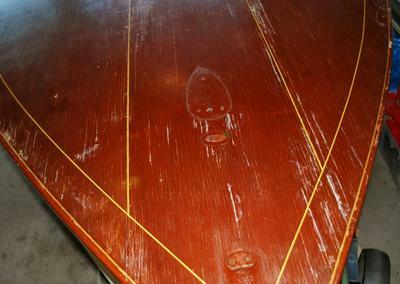 The complete deck has been stripped of old varnish etc., and sanded. Although there's some variation in colour (due to weathering I suppose) I was not planning to stain the deck but just varnish it as it was done originally. But I want to ensure to get the 'hole' repairs done right the first time! Thus looking for the best advice!!! Comments for Wood Filler & Stain? It’s difficult to get stains and fillers to match up with the original wood. You could try using some clear epoxy thickened with fine mahogany sawdust. Mask off the areas to be filled and apply it as level as possible to reduce the need for sanding when it has cured.